I finally got around finishing the dailymotion.com plugin, which is automatically downloaded the next time you start Tubulator 2. 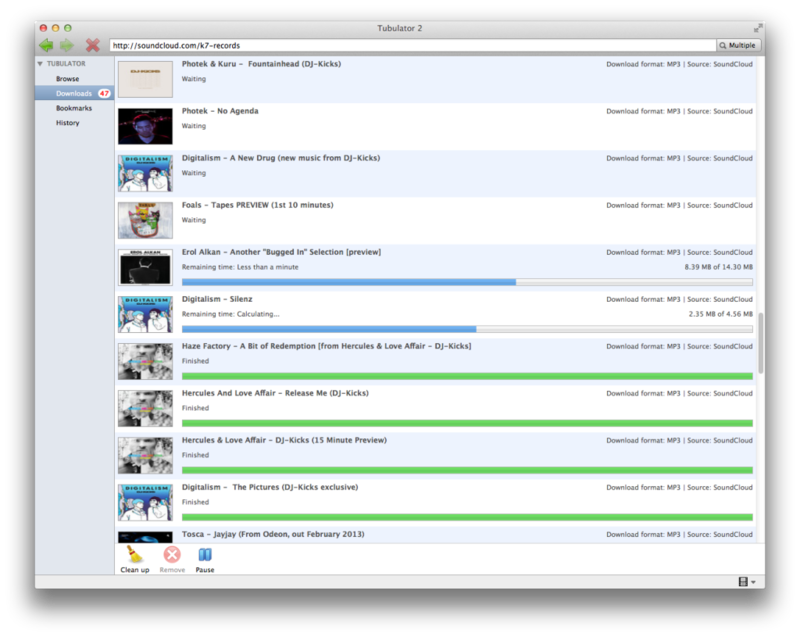 The plugin supports full HD videos and audio download. A current limitation is that only the first page is shown when searching by keywords due to an inconsistence in the API. I will compensate for that in the next application release. As promised, version 1.0.4 is fresh out of the press. This release is a strongly recommended update, as it fixes some annoying stability issues. … and I believe this will be the last point release before version 1.1. There’s been a lot of bugs to kill, and with the help of enthusiastic users I’m confident this release will be the most stable version yet. Tubulator is turning into a rather complicated beast, and improvement is only possible with the help of you guys sending error reports and suggestions. Two of the nicest features in the coming release is the possibility of setting the order of the search result tabs by dragging them, so for example YouTube results will always appear first. Another one is notifications when the download queue is done. Brad Smith suggested both of these – thanks, Brad! If you have suggestions, don’t hesitate using the Contact tab at the Support page, or use the in-app Feedback menu. I’ve set up an alternative to PayPal on the Purchase page for those of you who are not that fond of PayPal. The choice fell on Kagi, who has been handling payments for shareware software since forever. I am happy to announce that version 1.0.3 was released a couple of days ago. This release adds support for downloading media from soundcloud.com, and adds a lot of fixes and improvements. Most notably this release adds stability improvements, a fix for download slowdown introduced by the App Nap “feature” in Mac OS Mavericks and heavily increased download speed. A YouTube plugin fix was also added – it seems that YouTube now redirects to HTTPS by default. This redirect was not handled by Tubulator, causing downloads to fail. In the last couple of days it seems that users have not been able to download the initial plugins (necessary for the application to start at all). This problem has now been fixed. It was caused by a performance setting on the web host, effectively messing up the plugins. 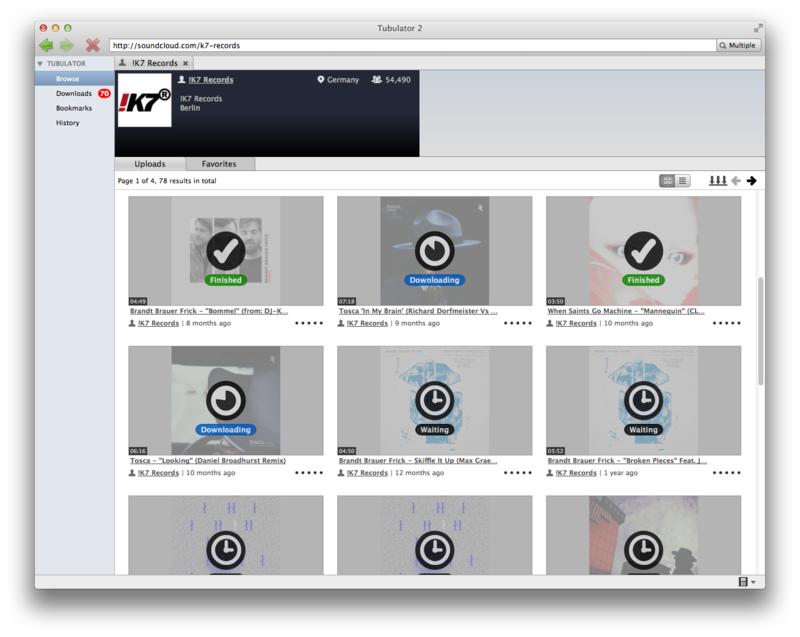 The SoundCloud plugin will be available with the 1.0.3 release. Also, the coming release will most likely have support for Mac OS 10.10 (Yosemite) – the current version does not play well with it. I am currently testing the newest Qt version, which should fix the problems.